The galaxy EGS-zs8-1 sets a new distance record. It was discovered in images from the Hubble Space Telescope's CANDELS survey. An international team of astronomers led by Yale University and the University of California-Santa Cruz have pushed back the cosmic frontier of galaxy exploration to a time when the universe was only 5% of its present age. The team discovered an exceptionally luminous galaxy more than 13 billion years in the past and determined its exact distance from Earth using the powerful MOSFIRE instrument on the W.M. Keck Observatory’s 10-meter telescope, in Hawaii. 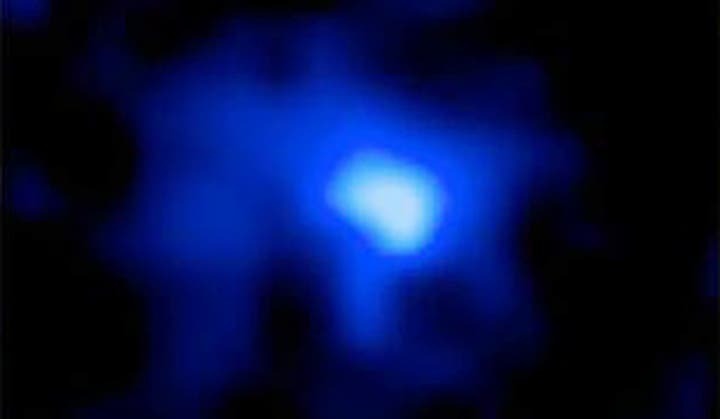 It is the most distant galaxy currently measured. The galaxy, EGS-zs8-1, was originally identified based on its particular colors in images from NASA’s Hubble and Spitzer space telescopes. It is one of the brightest and most massive objects in the early universe. Age and distance are vitally connected in any discussion of the universe. The light we see from our Sun takes just eight minutes to reach us, while the light from distant galaxies we see via today’s advanced telescopes travels for billions of years before it reaches us — so we’re seeing what those galaxies looked like billions of years ago. “It has already built more than 15% of the mass of our own Milky Way today,” said Pascal Oesch, a Yale astronomer and lead author of a study published online May 5 in Astrophysical Journal Letters. “But it had only 670 million years to do so. The universe was still very young then.” The new distance measurement also enabled the astronomers to determine that EGS-zs8-1 is still forming stars rapidly, about 80 times faster than our galaxy. The MOSFIRE instrument allows astronomers to efficiently study several galaxies at the same time. Measuring galaxies at extreme distances and characterizing their properties will be a major goal of astronomy over the next decade, the researchers said. The new observations establish EGS-zs8-1 at a time when the universe was undergoing an important change: The hydrogen between galaxies was transitioning from a neutral state to an ionized state. “It appears that the young stars in the early galaxies like EGS-zs8-1 were the main drivers for this transition, called reionization,” said Rychard Bouwens of the Leiden Observatory, co-author of the study. Taken together, the new Keck Observatory, Hubble, and Spitzer observations also pose new questions. They confirm that massive galaxies already existed early in the history of the universe, but they also show that those galaxies had very different physical properties from what is seen around us today. Astronomers now have strong evidence that the peculiar colors of early galaxies — seen in the Spitzer images — originate from a rapid formation of massive, young stars, which interacted with the primordial gas in these galaxies. The observations underscore the exciting discoveries that are possible when NASA’s James Webb Space Telescope is launched in 2018, note the researchers. In addition to pushing the cosmic frontier to even earlier times, the telescope will be able to dissect the galaxy light of EGS-zs8-1 seen with the Spitzer telescope and provide astronomers with more detailed insights into its gas properties. Ivelina Momcheva, a Yale associate research scientist, conducted part of the observations with the W.M. Keck Telescope and was among the other co-authors of the new study.